Is reading knitting charts any easier then reading a written pattern? Confused about reading knitting charts rather than the written patterns? There are many patterns that only use the charts and than many that have both written instructions and charts. A lot of times I like charts better myself. But as with everything, that is not always the case. Many feel they can get the over all picture of the item with a chart rather than wadding through all the written instructions and abbreviations. 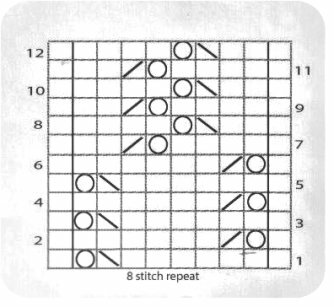 On a chart each square represents a stitch, in each square there is a symbol. 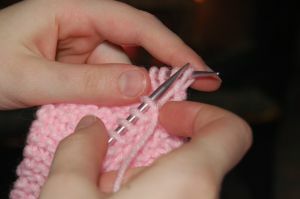 That symbol indicates how to work that particular stitch. You will find a key for each pattern that used these stitch charts to make it easy to follow. These keys tell you what each symbol stands for or what stitch it represents. Reading Knitting Charts are done like this. Start on the right side of your project and work the patterns this way. Work the first row from right to left. Start reading the chart at the bottom right hand corner and work or knit up the chart to the top. You will follow the chart bottom to top and right to left. The second row will than be read from the left to the right. Sometimes the pattern requires you to start on the wrong side. If your first row of the chart starts on the wrong side of the knitting, than read the chart from left to right. As you work with the charts you will get more comfortable with them. Begin with basic patterns and in no time you will get the hang of it. I think with any needlework, charts are far easier than the written directions. I tend to lose my place with the written instructions and than it takes me forever to figure out where I am in the pattern again. With the charts it is very visual. 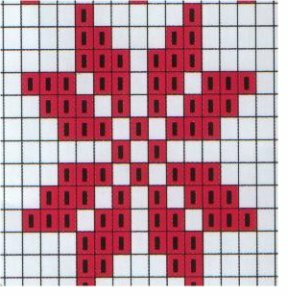 For more detailed information on reading knitting charts and how to use them, this book Charts Made Simple: understanding knitting charts visually will help you.